Census years are exciting times for the forms enthusiast. They’re quite rare – most countries run their census at 10-year intervals. And they affect the entire population. That’s the definition of a census – a count of an entire population. Census forms also present lots of lovely forms challenges. A census might be the ultimately complex form: it’s got lots of stakeholders, it takes years to plan, it has to work for absolutely everyone, and it usually includes a lot of relatively invasive questions. 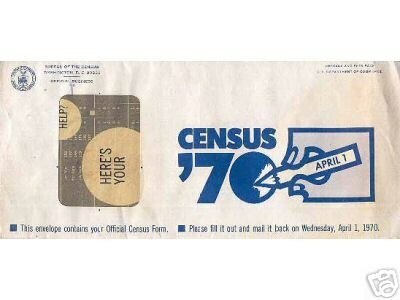 The US 2000 Census form was one of the shorter ones, at only four printed pages. Relax! You’re not in for a dissertation about the history, theory, realities, and everything else about a census. Instead, I’m going to concentrate on one rather small aspect of a census: the envelopes. Why? Because they’ll inspire some general questions that are worth thinking about when you’re designing any complex form. Users often want to print forms out, so they can refer to the printout as they gather the answers. Users may not want to submit a form electronically, because of their distrust of the technology or problems with it. Organisations may be unwilling or unable to accept a form electronically. Users may not have internet access or may not have convenient internet access at the time they are filling in a form. So, if you have to send out a complex form, you’ve got to have an envelope to send it in. Design question: does your form work as well on paper as it works on an ordinary computer? What does an envelope need to do? instruct – tell you what to do with it and when. Was the 2011 England and Wales census envelope a good design? It seems like a good idea to show you an image of the envelope for the 2011 England and Wales census – so here it is in Figure 1. You can see that mine got torn open eagerly. How well do you think it does on my three criteria of addressing, informing, and instructing? The census form’s envelope has the usual design feature: a glassine window to show the address that is printed on the form underneath. This has its challenges: the envelope has to be larger than the form inside by quite a margin, so the automatic insertion machinery can work. This means that the form can move around inside the envelope, so you have a smaller area to work with for your address than you might imagine. Even so, did the printed address have to be quite so small? Official-use information such as the barcode takes up most of the area within the window. I did a bit of measurement and calculation, and I estimate that the address occupies only about a third of the available space. The Royal Mail delivered 25 million census forms in England and Wales. A few of them must have gone to the wrong address. The post delivery people are users of the form as well: why not make it easy on them? I tried a bit of a quick redesign on the official use items, rotating them and moving them aside. I was able to increase the address area to about 70% of the available space. Figure 3 shows a mock-up of it. I hope you agree that the address is much more legible. Design question: have you got the right balance on your form between items for official use and items for users? You want to be sure that recipients open your envelope. If they discard it as junk mail, you’ve failed. Census envelopes typically have lots of official stuff on them. In Figure 4, you can see the artwork for the United States 2010 census envelope. Penalty for Private Use $300. Would I be alone in thinking that this is a little too much? If you were an illegal immigrant, would this very official envelope give you the confidence to open it and fill out your census? Why do these envelopes have such a proliferation of words and logos? Whoever did the visual identity and advertising campaign designed the census logo. Their brief probably did not mention the other logos. The branding department designed the ONS logo, independently of its likely eventual use on census envelopes. Someone else wanted to slap a coat of arms on there to make it all look official. Or maybe it’s there because some relevant bit of legislation requires it. I’d lay a fairly large bet that no-one had the job of thinking about what they’d all look like together on the only part of the whole census that everyone encounters. You can’t fill out the online census without your paper census form, because the paper form has a very long, coded number that lets you get at the online form. Design question: have you thought about how the various elements of your branding work together on your form? Filling out complex forms take time and effort. You don’t necessarily want people to rip them open straight away. You want them to tackle the form when they can give it the attention it deserves. On the other hand, you don’t want them to stick it a pile somewhere and forget about it. Neither of the two envelopes I’ve shown gives you any hint about the timetable for submitting the form. Maybe they didn’t think of it – or maybe they consciously decided to rely on media campaigns to provide that information, as shown in Figure 5. Open the envelope when you receive it. Check the questions to see whether anyone you’re likely to include on it would prefer to use an individual questionnaire. Ask those people to obtain their own individual questionnaire. Obtain answers from anyone who is likely to be away on the date of the census and does not want an individual questionnaire. Wait until March 27th, in case you have unexpected, overnight visitors. Fill out the census form. Perhaps that was just too difficult to explain. Design question: have you thought about what you really want people to do with your form and when? So far, I have been quite critical of these envelopes. I want to put my remarks into context. Censuses, like many complex forms, are complex in many different ways. procurement – not enough businesses bid for the delivery contract. pallets – the printed questionnaires occupied more pallet space than expected. photos – some of the printed photographs on the enumerators’ identity documents were of poor quality, with the potential to undermine public trust in the enumerators. This means there are lots of stakeholders and lots of users. For example, the concept census user generally means an organisation that uses data the census collected. whoever opens and deals with the census. All of them have slightly different, but interlocking needs. Design question: have you identified all of the internal and external users of your form? Does your form work as well on paper as it works on a computer? Have you got the right balance between items for official use and items for users? Have you thought about how the various elements of your branding work together on your form? Have you thought about what you really want people to do with your form and when? Have you identified all of the internal and external users of your form? And finally, I thought you’d enjoy the envelope in Figure 6. It’s an empty one from the US Census in 1970, so we can’t tell if it did well on my address criterion. But I think it did better than the current examples on inform and instruct.